Jim and Brooke Anderson’s dream house is a custom-made Lindal Log home in Rockford, Illinois. With a sixty-foot free span and panoramic windows, the log home commands breathtaking views of the surrounding rural setting. The log home was cozy during the rugged winter months but the interior became decidedly warm in the summer. The Andersons did their best to overcome the uncomfortable heat: reconfiguring the air conditioning system, repositioning the cold air returns, adding sky lights and finally fitting window blinds. All to no avail! Diligent research conducted through heating and ventilation engineers and their interior designer led the Andersons to a solar control window film specialist. Following a detailed analysis of the site, Vista UVShield Soft Horizons V33 and Ultima V14 solar control window film were recommended to reduce the heat and glare while virtually eliminating fade-causing ultraviolet sunlight. 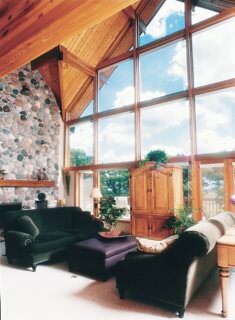 Vista UVShield Soft Horizons, which is installed on all the windows of the log home, is neutral in appearance and virtually invisible from both sides of the windows. The installed film halved the solar heat entering through the glass windows and reduced sun glare by more than 60%. Vista UVShield Ultima which is fitted to the sky lights is a high heat solar rejection window film that reduces solar heat by 78% and at the same time provides excellent visibility from inside to out at all times of day and night. Most high solar rejection window films produce a situation at night that prevent people inside the home from seeing out but allow those outside to see in! Both films carry a lifetime residential warranty for materials and labor. The results of the swift and efficient installation were immediate and dramatic. Internal temperatures were lowered by 12 degrees Fahrenheit and the surroundings seemed almost glare free. The blinds have gone and the windows provide uninterrupted views day and night. Jim and Brooke were delighted with their new comfortable room temperature which was so simply attained, albeit after much trial and error. They were also pleased that now their home furnishings and floors were not likely to fade with the harmful ultraviolet sunlight virtually eliminated. And they cannot tell that the film is there! Please contact Glass Enhancements, Inc. for more related case studies.